...Please know that there are two levels of EFT. 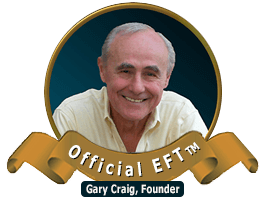 The level you are currently exploring is the Gold Standard (or Tapping) form of EFT that is in the hands of millions worldwide and has been imitated by hundreds of people. It forms a foundation for our more advanced spiritual level known as Optimal EFT. First: Here is a 7 minute EFT Intro video to this worldwide healing phenomenon. If you haven't already seen it, it is a great way to start your EFT journey. Second: Visit the Gold Standard (Official) EFT Tapping Tutorial. This easy-to-follow guide will acquaint you with the entire process: from beginner’s level to expert. You can get started using it right away and it is completely free. Third: Watch these two videos to see EFT in action for PTSD and Traumatic Brain Injury. Fourth: Find a Certified Gold Standard EFT Tapping Practitioner. This collection of professionals have undergone extensive training in the field. EFT, often called by its nickname, Tapping, has been exposed to millions, in over 20 languages. The basics are simple enough that even 10 year old children can get results with it. You can do-it-yourself or engage the skills of an EFT professional for challenging cases. Always consult physicians on all medical issues.